These are drivebys that are "always open" or, in the case of Smutt Putt Heaven, sometimes opens. Yards not shown here are either unseeable from the street or the yardist has asked to be removed. Remember to respect the art, the yard, and the yardist. And don't hoot at the neighbors! 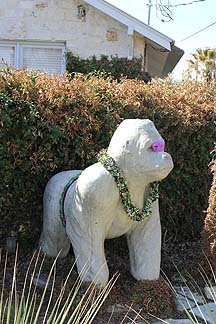 The gorilla on West Lynn, dolled up to honor the holiday du jour, is an Austin art yard classic. 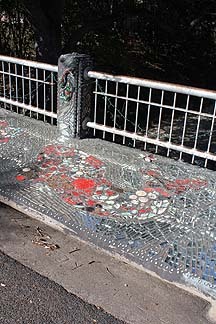 Just to the east of this address is a small art deco-ish bridge that Stefanie Distefano has slowly been turning into a huge (and gorgeous) mosaic. Giant koi fan across the sidewalk while city scenes peek out from the concrete drainage below. And don't miss taking a peek at the southern end of the bridge! Florence Ponziano opens her home to area children as a safe (and fun!) place to be. 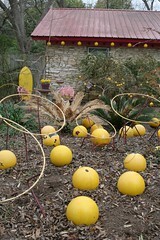 Her energy is infectious, and her yard and home are vivid expressions of her positive artistic energy. Florance is an accomplished mosaic artist, well known for her magically adorned guitars (and bras!). 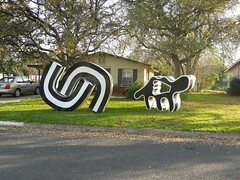 This front yard is a classic of Austin art yards. 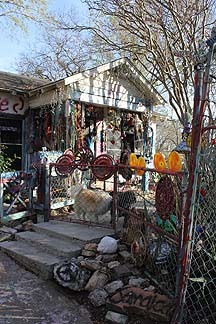 This stalwart of an art yard has been here since 1972 meeting and greeting visitors to this fine city from the East. Overheard at a dentists' convention: "The tooth? THE TOOTH?!?!?! YOU CAN'T HANDLE THE TOOTH!!!!!" Where do bowling balls go when they've lost their (rock and) roll? 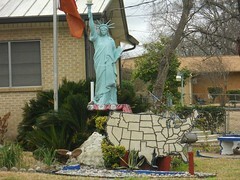 LuCretia Sisk's front yard seems to be the place. 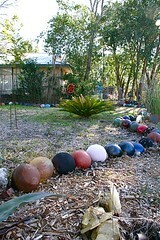 Several hundred bowling balls tastefully arranged in this yard featured by John Kelso and Texas Monthly. 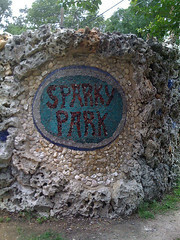 A cool little pocket park nestled into a fold of Hyde Park. Features a karstic grotto wall fused about the structure of a electric sub-station. Clinton Hofmeister, who's involved with an art program for teens at the Dougherty Art Center, has populated his front yard with large, abstract, Picasso-esque sculptures made out of cardboard. 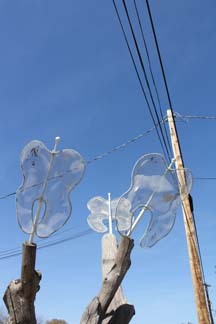 PJ Liles takes scrap metal and turns it into art, often flowers and hearts. 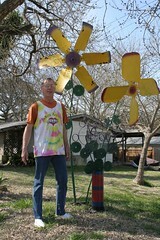 His front yard is ablooming with giant metal fan blades and gears. 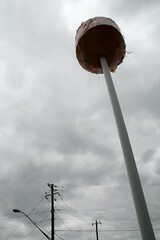 Yardist Jim Mansour may hate work, but he loves his giant lollipop (soon to be bear head) in his front yard. 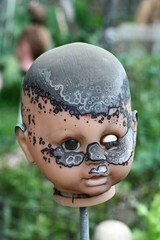 His back yard features various assemblages and a good time. As seen in "Humble Trash" and written up by John Kelso. YellowBall says it all: A collection of spherical objects in the hue of Big Bird.